Industry Experts unveiled a new market research report ‘Industrial Coatings– A Global Market Overview’. The new report reveals that, globally, volume consumption of General Industrial Coatings is the largest product segment, expected to maintain a CAGR of 5.7% between 2016 and 2022 and reach a projected 5.4 billion liters by 2022 from a forecast 3.9 billion liters in 2016. In terms of growth, however, the global volume market for Auto OEM Coatings is poised to post the fastest similar period compounded annual rate of 6.6% and reach a projected 3.3 billion liters by 2022, compared to a forecast 2.2 billion liters in 2016. The diversity of industrial coatings can be attributed to the extensive range of its application areas. This sector encompasses protective coatings for architectural steel, automobiles and other transportation media, oil and offshore structures and wood furniture and fixtures, just to name a few. Being primarily utilized for protecting substrates against attacks by chemicals, water, corrosion and the environment, industrial coatings have to perform in some of the most severe conditions. Adding to this has been the challenge of complying with environmental legislations enacted by regimes across the globe, which has compelled coatings manufacturers to focus on developing durable coatings that, other than meeting environmental regulations, also have to deliver outstanding performance. These factors have led manufacturers to rethink strategy and develop more eco-friendlier and innovative solutions that can address regulations and also offer the desired performance. 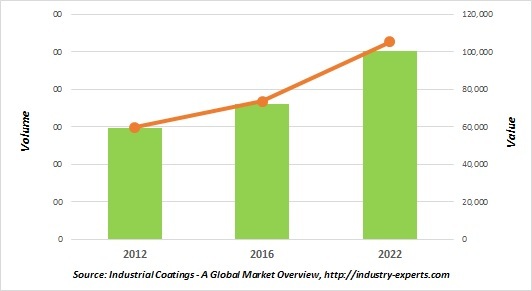 Global market for Industrial Coatings’ product segments analyzed in this study include Auto OEM Coatings, Auto Refinish Coatings, Coil Coatings, General Industrial Coatings, Industrial Maintenance & Protective Coatings, Marine Coatings, Packaging Coatings, Powder Coatings, Transportation Coatings and Wood Coatings. The global markets for the above mentioned product segments areas are analyzed in terms of both volumes in million liters and value in USD. Global demand for industrial coatings is estimated at US$73.8 billion in 2016 and projected to touch US$105.5 billion by 2022, growing by a rate compounded annually at 6.1% between 2016 and 2022. Asia-Pacific has been estimated to be the largest market as well as the fastest growing market in terms of both volumes and value during the above mentioned analysis period. This report reviews, analyses and projects the industrial coatings’ market for the period 2012-2022 globally and the regional markets including North America, Europe, Asia-Pacific, South America and Rest of World. The regional markets further analyzed for 15 independent countries across North America – The United States, Canada and Mexico; Europe – France, Germany, Italy, Russia, Spain and the United Kingdom; Asia-Pacific – China, India, Japan and South Korea; and South America – Argentina and Brazil. The 328 page global Industrial Coatings market research report includes 191 charts (includes a data table and graphical representation for each chart), supported with meaningful and easy to understand graphical presentation, of market numbers. This report profiles 37 key global players and 49 major players across North America – 23; Europe – 18; and Asia-Pacific – 8. The research also provides the listing of the companies engaged in manufacturing and supply of industrial coatings. The global list of companies covers the address, contact numbers and the website addresses of 153 companies.